Woodmanston was established in 1760 by John Eatton LeConte as an inland swamp rice plantation. This form of rice production actually began in the American Southeast in 1724. It relied on the diversion of slow moving swamp creeks into a reservoir created by earthen dams. 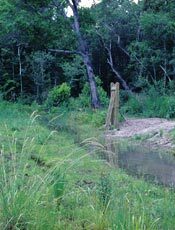 Water from the reservoir was then released through trunk gates into fields at lower elevations of the swamp where the rice was grown. After irrigation, this water was released into even lower elevations of the swamp where it continued its flow toward the ocean. It took between 200 to 500 acres to profitably cultivate rice, often subdivided into more manageable fields of 10 to 20 acres. A typical rice crop yielded 30 to 60 bushels an acre and weighed between 41 and 49 pounds per bushel. This early form of rice production was replaced by the tidal flow system, at the turn of the 18th century, by many plantation owners. In order to employ this new system, plantations had to be built along major coastal rivers. These plantations were not as susceptible to flood and drought as were the inland swamp plantations. Despite this rice production continued at Woodmanston, using the original method, until the end of the Civil War and even after by local freedmen. The first house at Woodmanston, located near today's Barrington Ferry Road, was burned in 1778 by the British because John Eatton LeConte was an American Revolutionary. Louis LeConte moved into the second home, called the hunting lodge, in 1810. It was there that he brought his wife, Ann. 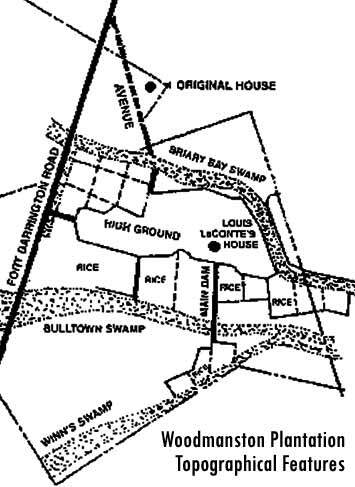 It was located closer to the rice fields and slave quarters. Although no pictures are available, researchers agree that the house was probably a raised-basement low-country plantation house similar to others in the area and fortified by a stockade to defend against Indian attacks. Homes were raised to avoid flooding, improve air circulation and keep the house cool. People also thought it would protect against harmful "vapors" from the swamp. The house had two full stories and an attic that became Louis LeConte's laboratory. Brick pillars still mark the old home site at Woodmanston. This is only part of the story. There is much to learn on each of our history pages.